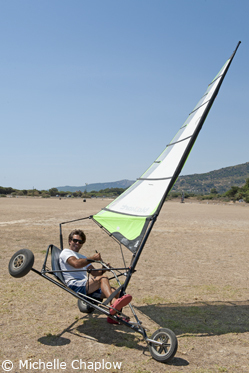 Land sailing, also called ´land yachting´ or ´sand yachting´, involves the maneuvering of low, wheeled vehicles using a sail similar to that used in windsurfing. The origins of the sport are disputed, but by many accounts, the Ancient Egyptians used a comparable on-land sail system. Around the year 1600, Flemish scientist Simon Stevin invented the precursor to the modern land yacht for Prince Maurice of Orange, to entertain the Prince´s guests. It wasn´t until the 1950s that land sailing became almost exclusively identified as a sport. Today, the sport remains niche, but more accessible to novices than windsurfing, and for the most part safer. Land yachts can still reach speeds of 70mph in some windier conditions (the world record is 116mph), unhindered by the water resistance of traditional sailing, but being rooted on the ground is a reassurance for many. 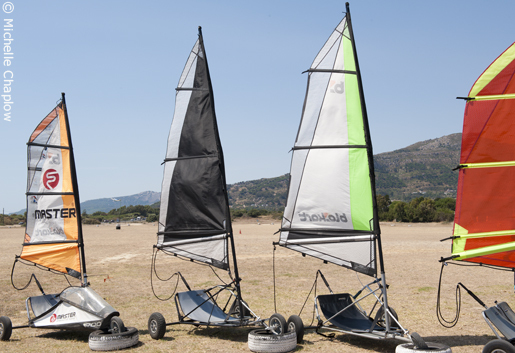 The vehicles do not generally have brakes; users control their speed and movements by easing off the sail, or turning into the wind. The windy conditions which characterize Tarifa obviously lend themselves to land sailing, and those interested can take short courses with Landsailing Tarifa, who occupy a flat, sandy patch of land 3km out of town, opposite the Playa de los Lances. A 45-minute course is 28€, and children between 6-8 can accompany an adult in a double cart for an extra 12€. Suitable for families or groups of friends, these controlled conditions offer a great chance for beginners to feel the exhilaration of land sailing, and to get involved with the wind sports which attract so many people to the area. Trying out some landsailing tricks in Tarifa.